As we head into spring, our bodies and minds are ready for the warmth yet it’s still feeling like winter. Yesterday we had this surprise snow which was beautiful coming down, and then thankfully disappeared by the warmth of the afternoon. 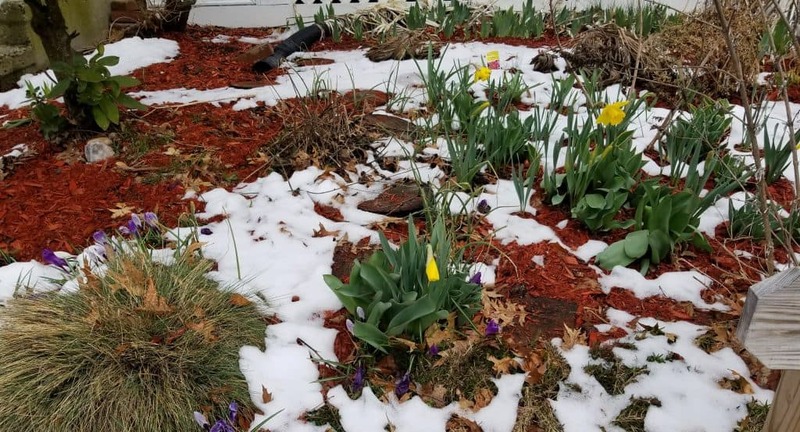 This sums up spring in the Northeast. I remember it was way more defined growing up in NJ- and April to me (my birthday month) was SPRING. These days, it’s just not how we remembered it to be, and now in this first week of April, it’s still only 40 degrees. That’s COLD. We still have our basket of hats, gloves, scarves in the hall. Our winter boots are lined up and coats are still hanging. Yet the buds are forming on the trees and the early flowers such as crocus, snowdrops and daffodils are popping up everywhere. This in between feeling can make us a little uncertain and feel a bit dragged down. I know that I am SO ready for the warmth and sunshine of spring- yet what we teach the kiddos- we can’t control the weather. We can control how we respond, but we can’t control what happens out there in the world -as much as we’d love to try. We teach the kids this exercise called The Weather Report. Sometimes its hard to put a label on how we are feeling in this moment. I know I can’t describe it sometimes. This is one of our mindfulness activities in the Mindful Yoga Breaks Card Deck®. We LOVE to use it in all our classes. This activity lets students observe how they feel without letting their emotions take control. 1) Ask students to think about a weather report that best describes their emotions or feelings at the moment. Some options can be: sunny, rainy, stormy, calm, windy, tsunami, etc. 2) Have them share their weather report with the group or a friend. How do we respond to different weather? We change our clothes, we change our activities, WE have control of what WE can do and respond accordingly. We can use a weather word to describe the weather inside us. Just like we can’t change the external weather, we cannot change our internal weather. Emotions will come and go and pass just like the weather. We may feel like a hurricane, but we are not that hurricane. We can acknowledge our emotions without reacting. What can we do when we acknowledge our emotions? We can ask for a hug, take a deep breath (one of our Anchor Breaths from our MYB Card Deck) or talk to a friend. Our emotions don’t define us- they are not WHO we are. So as we go about our spring and we experience the highs and lows of this crazy weather (at least here on our side of the US), we can figure out how to best respond to one day snow, next day rain and the next day 70 degrees and sunny! Just like the changing weather, our moods and emotions will pass through us and we need to figure out how to best respond. Giving kids (and adults!) these tools to self-regulate is the key to managing our OWN emotions and figuring out what helps to calm us when needed. It’s my favorite part of this work- teaching these oh so important tools that I know would have helped me in managing my emotions as a kid. What are you doing to help manage your emotions during the changing seasons? How do you calm your hurricane inside?